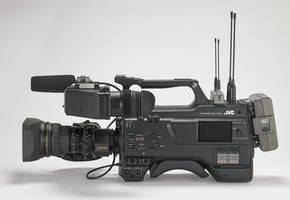 WAYNE, NJ (July 25, 2018) – JVC Professional Video, a division of JVCKENWOOD USA Corporation, will demonstrate the new GY-HC900 CONNECTED CAM broadcast camcorder and other products at the Texas Association of Broadcasters 2018 convention and trade show on Aug. 2 at the JW Marriott in downtown Austin. Designed for high-end EFP, ENG, and studio applications, the new 2/3-inch camera features a new communications engine that optimizes both image processing and video-over-IP performance. With built-in Wi-Fi and dual external antennas, CONNECTED CAM delivers up to 20 Mbps streaming performance. When paired directly with the optional ProHD Dockable Bridge or via Wi-Fi with any ProHD Bridge unit, CONNECTED CAM allows on-air talent to conduct a two-way interview with return video while streaming live to air without any external boxes or backpacks. CONNECTED CAM enables simultaneous recording, low latency streaming, and simultaneous decoding for return video and IFB. For reliable transmission, the camera also features Zixi™ error correction with automatic repeat request (ARQ) and SMPTE 2022 forward error correction. Latency can be as low as 500ms for both outgoing and incoming video. The camera features three 2/3-inch CMOS image sensors for full HD imagery, and delivers excellent sensitivity (F12 at 60Hz, F13 at 50Hz in extended mode) and high 62dB signal-to-noise ratio (in standard mode). Up to 120fps 1080p slow-motion recording and an HDR mode provide creative flexibility. CONNECTED CAM supports native recording of MPEG-2 at up to 35 Mbps and H.264 for production quality 10-bit, 4:2:2 footage, as well as the Sports Exchange Standard format. Beyond ENG, the GY-HC900 is an ideal choice for high-end EFP and studio fiber applications. It works with the FS-900 camera module, which attaches seamlessly to the camera via a 68-pin interface, and feeds 3G-SDI signals, control, audio, sync, and intercom to a base station via fiber. CONNECTED CAM features an industry standard B4 lens mount, and is available with or without a 20x zoom lens. Other features include dual SDHC/SDXC memory card slots, OLED color viewfinder and LCD panel for menu navigation, integrated 3G-SDI pool feed input, three XLR audio inputs, wireless audio module slot, and an IPX2 water resistant rating for operation in challenging weather conditions.